Contributors to this page: ICRISAT, Patancheru, India (RP Thakur, AG Girish, VP Rao). Ralstonia solanacearum (Smith) Yabuuchi et al. Bacterial wilt is a major constraint to groundnut production in China, Indonesia and Vietnam. Yield losses of 10 to 30% commonly occur and can reach over 60% in heavily infested fields (Mehan et al. 1994). Wilt symptoms can be seen 2-3 weeks after planting. The first sign of disease is a slight drooping or curling of one or more leaves. In more advanced stages, the plants may bend over at the tip, appear dry, and eventually turn brown, wither, and die. Infected plants have discolored and rotten roots and pods. The diagnostic characteristics of this disease are the dark brown discoloration in the xylem and pith, and the streaming of ‘bacterial ooze’ (Mehan et al. 1994). Arachis hypogaea (groundnut), Capsicum spp. (chillies), Gossypium hirsutum (Cotton), Ipomoea batatus (sweet potato), Lycopersicon esculentum (tomato), Manihot esculenta (cassava), Musa spp. (banana), Nicotiana spp. (tobaco), Solanum melongena (brinjal), Solanum tuberosum (potato) and Zingiber officinale (ginger). Bacterial wilt is global in distribution, and mostly prevalent in several countries of Asia, Africa and North America. Ralstonia solanacearum is an aerobic, non-spore-forming, rod shaped, gram- negative bacterium. The bacterial cells measure approximately 0.5 ´ 1.5 m. Virulent isolates are mainly non-flagellate and non-motile. Avirulent isolates usually bear 1-4 polar flagellae and are highly motile. Common fimbriae are often present in both virulent and avirulent isolates. Although it does not produce fluorescent pigments, it produces a brown diffusible pigment on a variety of agar media containing tyrosine. The bacterium grows at a wide range of temperatures from 25 to 35°C. The bacterium is mainly disseminated through infested soil, water and infected seed (Anitha et al. 2003). Direct plating of 4-week old leaf-twigs, leaf-bits and seed on Tetrazolium chloride agar (TZCA) medium is used to detect the wilt pathogen in groundnut (Prasada Rao et al. 2000; Anitha et al. 2004). Incineration of the infected plants and rejection of the seed samples. Anitha K, Gunjotikar GA, Chakrabarty SK, , Singh SD, Sarath Babu B, Prasada Rao RDVJ and Varaprasad KS. 2003. Interception of bacterial wilt, Burkholderia solanacearum in groundnut germplasm imported from Australia. Journal of Oilseeds Research 20: 101-104. Anitha K, Chakrabarty SK, Girish AG, Prasada Rao RDVJ and Varaprasad KS. 2004. 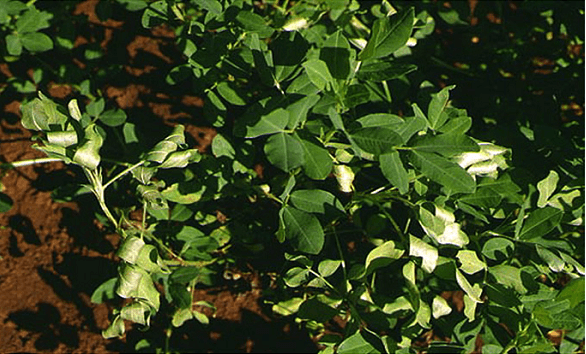 Detection of bacterial wilt infection in imported groundnut germplasm. Indian Journal of Plant Protection 32:147-148. Mehan VK, Liao BS, Tan YJ, Robinson-Smith A, McDonald D and Hayward AC. 1994. Bacterial wilt of groundnut. Information Bulletin no. 35. Patancheru, AP 502 324, India: International Crops Research Institute for the Semi-Arid Tropics. 28pp. Prasada Rao RDVJ, Gunjotikar GA,.Chakrabarty SK, Varaprasad KS, Singh SD and Bramel-Cox PJ. 2000. Detection of Ralstonia solanacearum in seeds of wild Arachis spp. imported from Brazil. Indian Journal of Plant Protection 28: 51-56.